Carson Kropfl, 13, turned a chance encounter on an elevator into an investment opportunity with serial entrepreneur, author and philanthropist, Sir Richard Branson. What started out as a way to raise money for surf lessons and contests, and avoid chores, turned into a thriving skateboard business with unique and patented designs. It was recently announced that this thirteen-year-old inventor and Chief Fun Officer of Locker Board was awarded a design patent for his unique, rectangular-shaped skateboard deck that fits in a standard-sized locker or backpack. 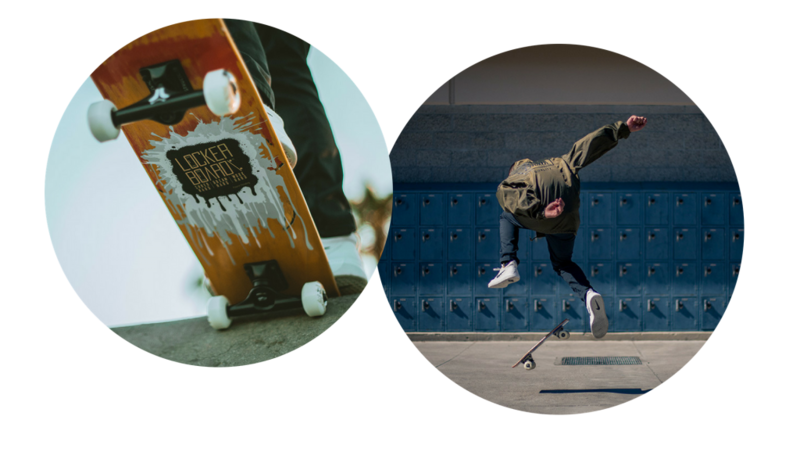 Locker Boards are the only non-folding, sustainably-sourced skateboards on the market that are designed specifically to fit in a school locker or backpack. His squared-off version of the traditional skateboard was an immediate hit, thanks in no small part to relationships with the Virgin Group, an appearance on Shark Tank; and investors like Sir Richard Branson, who owns 20% of the company. The Locker Board patent is the second patent the young inventor has received. CEOKID was excited to catch up with Carson to learn more about his inspiration forLocker Board and what pushes him to reach his goals. What inspired you to create Locker Board? It was my first time being in middle school and the first time I had a locker. My locker was decked out and awesome, but none of my skateboards would fit in it. So, I decided to make one for myself that could. I came up with five different designs until I got the right fit. My Dad helped me with the saw. At first I created the Locker Board for myself, but when I brought it to school all the other kids really liked it. Then, my parents told me that I had to do chores to pay for my surf contests and surf lessons. I hate doing chores so I asked them if I could try selling my Locker Board skateboards instead. I went to my local skate shop and asked them for the recycled skateboard decks that kids left behind when they bought new skateboard decks. They gave me 30 recycled decks. I cut them down and turned them into Locker Board decks. I took them to school in my backpack and sold them for $20 each. I saved up $1,000 and started buying trucks and wheels to make complete skateboards and launched a website. What makes Locker Board different from other skateboards? It is compact so it can fit inside a backpack or locker. It’s made from 100% recycled maple wood. I designed the Locker Board to be good for the planet, fun to ride and easy to take anywhere. They are great for school and traveling. You are one of the youngest entrepreneurs to appear on Shark Tank and land a deal with Sir Richard Branson. How did you prepare for your appearance on Shark Tank? Every night I would read my pitch and what I was going to say. I would come up with a bunch of questions they could possibly ask. Shark Tank doesn’t tell you what the sharks might ask you so you have to prepare with what you think they might ask. What advice do you have for a kidpreneur who wants to appear on Shark Tank? Seize the moment, never give up and believe in yourself! It took a really long time for me to get on Shark Tank , 4 years. That’s like a quarter of my life! I made my first product, Streetubez, when I was seven years old. Streetubez is a skateboard accessory that allows riders to surf anywhere, anytime. It’s this sail that you pull on and it creates this giant wave that you skateboard through – so it’s like you are surfing and getting tubed. I was recently awarded a utility patent for it. I was in the mountains one day on a vacation and my family was in an elevator going to breakfast. There was a guy on the elevator wearing a shirt that said Shark Tank . My dadasked him if he had ever been on Shark Tank and he said that he was the executive producer for the show, Max Swedlow. I love Shark Tank so I jumped into action and started showing him pictures of Streetubez from my Mom’s phone. He sa id the company was too small for Shark Tank but he gave me his contact info and told me to keep in touch. Every few months I would update him on what was going on with Streetubez. When I started Locker Board he said I was ready for the show. If I hadn’t manned up and given Max an elevator pitch I wouldn’t be standing here today. When you’re blessed with opportunities you need to seize the moment, you may never get that chance again. Also, never give up. It took me 4 years to get on the show. You also have to believe in yourself. Richard Branson told me that one of the reasons he invested in me is that I reminded him of himself. People don’t just invest in your company they also invest in you. If you don’t believe in yourself, no one else will. You are an award winning entrepreneur, public speaker, and activist for the ocean. To what do you credit your success at such a young age? My parents, Shark Tank, Sir Richard and of course my customers and fans. I couldn’t have done this without my parents help. They give me a lot of support. Shark Tank gave me this opportunity. I’m super grateful to the producers of the show, especially Max Swedlow. He gave me his time, listened to my elevator pitch and kept in touch with me. And of course, Sir Richard Branson is a big inspiration. When he invested in Locker Board it made me think this could be a huge deal. I’m learning so much from him and hope that I’m making him proud. The most important reason for my success is my customers and fans. A lot of people have bought Locker Boards and shared about me on social media and that’s why I have had success. Without my customers and fans, I wouldn’t be here today. One of your mottos is “Never Give Up.” What gives you the courage to keep going when you may want to quit? I think what pushes me to keep going is when people come up to me and tell me that I inspired them to go after their dreams. I recently did a TEDx Talk and there were tons of kids who came to see me. Some of them had been bullied and thanked me for encouraging them and sharing my story. That was really cool. The thing that I’ve learned and want to share with other kids is that when people put you down it means that they are threatened and jealous. You have to learn how to tune out negativity and surround yourself with positive people. I know it’s hard sometimes, but always be true to yourself. The kids that are different are the kids who make a difference. It’s also cool when I’m in New York, Washington DC or random places and people come up to me and ask, “Are you the kid that was on Shark Tank”? I think to myself, “How do you know who I am?” I have a lot of fans and that’s super fun. I’m realizing that I’m an influencer and want to use my influence to make a positive impact and help others. My friends and I created the #SaveSanO Movement to save one of our favorite surf breaks in our town from becoming a nuclear waste dump. Safe storage of nuclear waste is one of the most critical environmental issues facing mankind. There are 100 nuclear power plants in America and 450 in the world. There are no safe storage facilities in the US capable of storing nuclear waste. My town of San Clemente is home to one of the largest nuclear waste dumps in the United States. 3.6 million pounds of nuclear waste is being dumped right on our shores in canisters that have a history of cracking and leaking. If there is a nuclear disaster it will affect everything in a 50 mile radius, which means all of Southern California would be affected. There are 8.7 million people living in this 50-mile radius. We are trying to get the waste stored in safer canisters and moved to a safe facility. This is a complicated issue and one we can “never give up” on. I was invited to speak on the Greenpeace ship to educate people about the issue. I have some neat opportunities right now because of everything that has happened and I want to use these opportunities to help make a positive difference in the world. That really inspires me to “Never Give Up”. Learn more about Carson Kropfl and Locker Board at https://www.lockerboard.net and follow him on Instagram @lockerboard.